A "Modulation Method" is a format and data rate in which wireless data is sent over the air. FHSS and DSSS was used in the early 802.11 standards, while OFDM is being used by many of the newer standards. The newer modulation techniques and data rates are more efficient, but older modulation techniques and data rates are still supported for backwards compatibility. FHSS (Frequency-hopping spread spectrum) is a transmission technology where the data signal is modulated with a narrow band carrier signal that "hops" in a random, but predictable, sequence from frequency to frequency. This technique reduces interference because a signal will interfere only with other signals transmitting at the same frequency. FHSS devices operating in 2.4-2.5 GHz ISM band must comply with FCC part 15.247 regulations. This includes the use of at least 75 hopping frequencies arranged pseudo-randomly, precise hopping synchronization between all the modems in the network and a maximum dwell time of 400 msec. DSSS (Direct-sequence spread spectrum) is a transmission technology where the data signal is combined with a higher rate bit sequence, or chipping code, that divides the user data according to a spreading ratio. The chipping code is a redundant bit pattern for each bit that is transmitted, which increases the signal's resistance to interference. 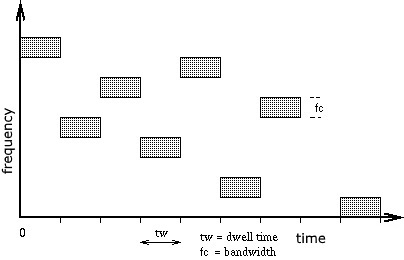 OFDM (Orthogonal Frequency-Division Multiplexing) splits the radio signal into several sub signals which greatly reduces interference between signals.